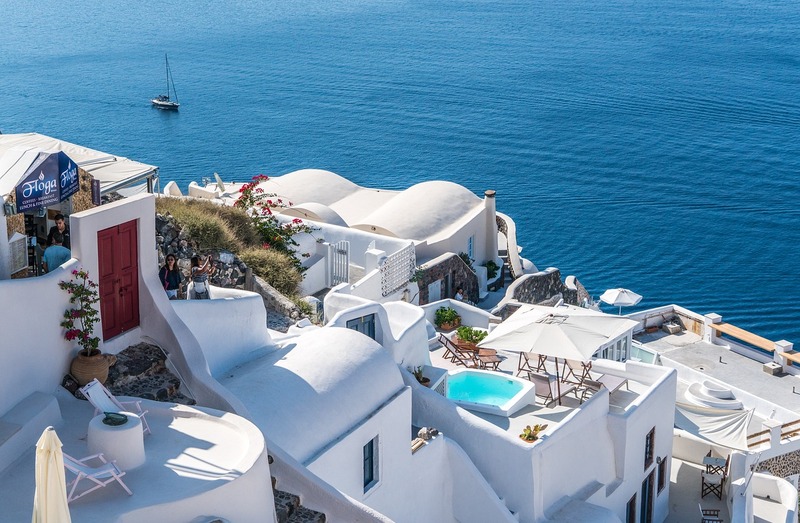 Sun, sea, fun and ... culture: a holiday in Santorini, discovering one of the most beautiful and evocative islands in all of Greece. Do the check-in in the hotel, take a dip in the pool (there will surely be one), and start choosing the means to move to the island. If you are a couple, opt for the scooter. Possible also, that you have already rented the car directly at the airport. For this first day, we recommend starting out to discover Thira. The capital of the island, at 300 meters above sea level, is a cluster of narrow alleys and typical architecture and asks for Cycladic (the latter, with the typical celestial domes). From here, views and landscapes really impressive. Walking, you will meet the splendid Cathedral Agiou Ioannae, of which white is the dominant color. Rather small and simple, with arches, and twin domes, dedicated to the cult of St. John the Baptist. It is one of the few Catholic churches on the island. It is right in the middle of Thira and to reach it you climb a flight of stairs. Open daily from 09: 00 to 21: 00. Even in Thira you can watch a magical sunset. Opposite the beautiful Orthodox church, for example Or, better yet, in the quiet neighborhood of Kato Thira; probably the only one who, far from the crowd, still retains the genuine and authentic character of the Cyclades. Among the low houses, the narrow alleys, will open absolutely magical glimpses, like the one from the church of Kato Thira. Obviously, to dine, we recommend staying in the area. The offer is very varied, being in perhaps the most touristy place on the island. You can opt for a Pita with souvlaki, tzatziki and tomatoes (really wonderful in this area) or stop at a restaurant. There are also numerous places to have a drink, listen to music, or relax while watching the night view of the Caldera. We recommend waking up early; make a hearty breakfast, prepare your sandwiches that will accompany you during your first day at sea. However, let's make the due premise: those who choose Santorini do not do it solely for the sea, but for the "outline". Here you will not find the most beautiful beaches in Greece. Often, the dark, volcanic backdrop does not even fully appreciate the beauty of the water. There are, however, some coves and inlets that do not go unnoticed. Red Beach, or the Red Beach, is one of these. Situated in a vast inlet, it was formed by erosion and landslide of the mountain above it; It has a bright red color tending almost to black / purple that is a perfect contrast with the blue of its waters: a beautiful show! The beach, located on the south-west of the island, can only be reached through an impervious path, without side parapets and with slippery ground. WEAR COMFORTABLE SHOES and, above all, get there early in the morning; after the 10 starts to crowd and from midday you will be leaning against each other !!! To be avoided with children. Nearby you will also find a refreshment point. Along the same bay, you will find three other beaches: Kambia, Mesa Pigadia (also called Black Beach) and above all White Beach; the latter, in our opinion, it is the best of the island and, to it, a separate day should be dedicated. After the hours spent in the sun, the sea and the relaxation, if you are not too tired, take the scooter (our recommended way to turn) and reach the Akrotiri Lighthouse; you will cross the village of the same name first, and the little one Eklissia Agios Eleftherios onwards. Akrotiri Lighthouse it is a quiet place, in the extreme point of the south-west of the island, with a striking view and beautiful sunset. Do not miss during your Santorini vacation. Few venture here but it is definitely worth it! At this point, you will be exhausted. We recommend that you regain your energy by relaxing in the Hotel. Go in the direction of Thira; from the old port, every day boats leave for trips and excursions to the volcanic islands of the caldera; you will learn about the wild beauty of a volcano that has changed, thousands of years ago, the history of Mediterranean civilizations. Nea Kameni e Palea Kameni they are the destination for your morning. Typically, these excursions last from 3 to 4 hours, starting with a visit to Nea Kameni, also known with the smaller island, such as Volcano. A islet completely devoid of life, except for a tree on top and a few succulents, and surrounded by dark and warm waters. Even the smallest is more suggestive Palea Kameni, where you can bathe in the hot springs, with water at a constant temperature of 33 degrees. This water is incredibly rich in sulfur (mainly responsible for the orange color of the rocks around the area); you can bathe in the gas bubbles! To reach them, you will have to take a swim; because of the muddy area, the boats can not get close, to avoid getting stuck. In Thira, you will find numerous offices offering organized tours for Kameni e Thirasia; in some cases, you may even choose to have lunch or stay until sunset. We recommend going there. You will appreciate more your Santorini holiday. Generally to visit Nea and Palea Kameni you should pay 20 € approximately. For the afternoon, we recommend a trip to the beautiful Prophet Elias Monastery and to the nearby town of Pyrgos. Moni Profiti Ilia, is one of the oldest churches in Santorini, probably dating back to the tenth century. The monastery is really beautiful, located on the homonymous mountain from which you can enjoy a fantastic view over the island. The monastery is quite nice, even if it can not be visited at all. What fascinates, however, is the suggestive landscape; from here, the view sweeps up Kamari, Perissa, Fira and the Caldera, until lost in the horizon of the island. The road is not the simplest. Passing Pyrgos, you must follow the road until the end; in the middle of the final straight, there is a small door on the right that leads to the small cloister. The Monastery is open from 08: 30 up to 17 and houses a folk museum inside and a more interesting ecclesiastical museum with crucifixes, goblets and holy relics. Keep in mind that from this height, even in summer, it pulls a lot of wind. Following the directions for Pyrgos, you reach the town of the same name in the hinterland of the island. Capital up to 1800, the city is a splendid Venetian fortification in a maze of houses, churches and narrow streets that wind around the Venetian castle (KASTELLI), following the shape of the hill. It is truly a charming place, with beautiful views and wonderful sunsets on the island. We recommend stopping here for your dinner: the offer in the area is quite extensive. To try, the inevitable souvlaki! On the other hand, those who do not want to miss an hour of sea can postpone Pyrgos' visit for the evening, and opt for the beautiful beach in the afternoon. Perivolos, continuation of Perissa. It is a gray sand beach, equipped for water skiing and diving. It is the beach of fun, thanks to its numerous bars open until late. After leaving little space to the sea, this day we recommend to dedicate it entirely to relaxation. We recommend to reach White Beach e Black Beach, adjacent to the most famous Red Beach. To get there, you must necessarily go to the Red beach. Also in this circumstance, we advise to leave as soon as possible; keep in mind that the first boat starts at 10, and the last one at 17. The cost is € 5,00 per person. Photo ©, Ernest McGray Jr.
White Beach, is less famous than the "sister" but, in our opinion, even more beautiful. Unmissable during the Santorini Vacation. It is visible, already along the path towards the Red Beach, offering a wonderful glance. Beautiful location: pebble beach and white pebbles and dark sand, typically of volcanic origin; the name of Spiaggia Bianca is due to the presence of white-colored rocks that surround it. Crystalline water. The beach is quite small, and equipped with umbrellas and sunbeds. Da White Beach, the boats arrive up to Mesa Pigadia, dubbed Black Beach, because of the large brown pebbles that characterize it. Black Beach it is a rather small and not very frequented cove, situated near the Faro, at the south-west extremity of Thera. It is little known and publicized, but here, as never before, the waters are really limpid and crystalline. Equipped beach. We advise you to organize yourself when taking the battell. You could stay most of the time at White Beach, and, after lunch time, spend the last hours, between the waters of the Black Beach. Or vice versa, of course. At 17: 00, with the last boat you return to the Red Beach. After a shower and just relax, make sure you reach the beautiful Imerovigli before the sunset. Right from here, you will enjoy the most beautiful sunsets on the island. It is no coincidence that, due to its spectacular view of the Caldera, it is nicknamed the "Santorini Terrace". Obviously, no seats in the front row; here they are used to arriving even more than an hour earlier, just to stay in front of everyone. Just over two kilometers from Thira, Imerovigli is mostly made up of hotels and restaurants; there are few houses. The 1956 earthquake left many homes, forcing many residents to seek refuge elsewhere; a skilful intervention, however, has brought it back to its former glory. Among the alleys, panoramic and not, there are many churches; the splendid does not go unnoticed Ekklisia Theoskepasti, built on the edge of the cliff with a postcard view; in front of it, there is the fortress of Skaros, which, in ancient times, was used to defend against the entry of pirates into the bay. Built entirely of stone, Skaros also had a wooden access bridge of which the remains are still visible. Everlasting Skaros (not a coincidence) is the name of the restaurant that we recommend, for direct experience. Great for quality / price; try the Moussaka, served in terracotta pans, washed down with local wine. Sea view: look for a table, just to enjoy the view. Day dedicated entirely to Iá (Oia), beautiful and picturesque village. The churches with shining domes and the various houses almost suspended in the void, now belong to the collective imagination. For the morning, we recommend the excursion to AMOUDI BAY, beach of Oia, reachable with a descent of about 215 steps; or, alternatively, with a more convenient road that can be traveled by car, outside the town. Amoudi Bay it is located inside a cove overlooking the caldera. Small, and enclosed by scenic red cliffs and picturesque buildings in the background: it is by far one of the most beautiful and evocative beaches on the island. Here are several taverns, where you can have lunch: Ammoudi Fish Tavern, Katina Tavern, Sunset Ammoudi o Dimitri Seafood. There is also a small marina, from which excursions to Thirasia leave. Beautiful the nearby islet with the Ekklisia Agios Nikolaos, a small church that is reflected in crystal clear waters, reachable by sea. In the afternoon, dedicate it to the visit for the town: it's really beautiful. You can walk through the beautiful, narrow and labyrinthine alleys, extremely crowded, especially during the "hot" periods. Even here, as indeed on the whole island, there are typical churches with shining domes. Iá offers ideas for numerous photographs: every alley, place, foreshortening, takes on a particular beauty: houses with strange shapes, suggestive chapels, restaurants and hotels almost dug into the rocks. Unlike Thira, despite the many tourists, Oia he has always tried to maintain his physiognomy, sometimes almost snobbish. Here you will also find art galleries and shops of some importance. Oia it is also the favorite destination for tourists to wait for the sunset: they say that from here, it is the most beautiful. The Top is represented by Londsa castle; you can get there on foot, from the alleys inside the center, until you reach the extreme point of the habitation. Here, one finds the Venetian fortress now in ruins, and once the seat of the Argyri family under the Venetians. Also from here, you can admire almost the whole village with the mill, Thira and the Caldera. Obviously, it is very crowded, and if you want to avoid being paralyzed in the crowd, you have to get at least one, or even two hours before the sun sets: just so you will have a front row seat! For dinner, we advise you to get closer to your hotel's area, in order to have a restful shower before. If you were to go to the area Kamari, the promenade, entirely pedestrian, is full of places to dine, drink, and dance. Approaching stop at the start and end of the Santorini Vacation. Sun and lots of sea. It begins, however, with a piece of History of the island that deserves to be visited: the ancient Thera. The Archaeological Area Ancient Thera, is located in a magnificent position between the Monte Profitis Ilia and the sea; just after a long, rough path, past the chapel Agios Stéfanos, raised on the remains of an early Christian basilica, you reach the panoramic point on the underlying black beach of Kamari. Not far from here, the Témenos of Artemidoro, a sacred enclosure; past the paved main road, you reach theAgorá and Royal Gallery with remains of the perimeter walls and columns, and what remains of the Theater, in a splendid position on the sea. In the last part of the route, we reach the Sacred Area, a true religious hub of antiquity: the foundations of the Temple of Apollo Karneios. The archaeological area is open every day, except Mondays (closing day) from 08: 30 to 14: 30. The entry ticket costs 2 €. It is located southeast of Thira, about 10 km from the capital; to get there, you must follow the signs for Kamari, the inhabited center is left, a winding road, bends curves and uphill, leads to destination. Do not forget water, hats with visor and protection: the height, the sun, the wind and the lack of shaded areas are not to be taken under your feet! After spending a couple of hours, we recommend returning to Kamari, for a little relaxation along the beautiful beach of the same name, famous for its black sand, and for being the largest of the island. We recommend having lunch in the area: the promenade is full of bars, restaurants, taverns, minimarkets, gyros and much more. You are spoiled for choice. A little before sunset, we recommend returning to your hotel. Make sure you reach the beautiful Firostefani before the sun has disappeared. Just in this tiny and picturesque village, continuation of Firá, you can end your evening in beauty, admiring the sunset, perhaps more evocative of the whole island. Firostefaniin fact, it is the highest point of all Santorini and, for this reason, dubbed the Island roof; besides, you will not find the chaos and the crush of IA o Thera. The beautiful sunset is a trailblazer to the final dinner of the holiday. Kanoa recommends Mylos, excellent panoramic restaurant bar, right in the area. Unavailable prices but you eat well; the view, then ... Obviously, the alternatives are not lacking, considering that Thira is a few minutes from here. Leaving is always difficult, but do not despair: you can always come back to Santorini !! For the last day, if you have at least half a day at your disposal before transferring to the airport, you could wade away your desire for the sea, on a beach where you did not spend any time. In this circumstance, we want to offer you more than one, so that you can choose the one closest to your accommodation, or, perhaps, to take into account in case you have more time. Perissaabove all, it deserves due consideration; a long beach, one of the most popular, located in the south-eastern part of the island, with black lava sand and the deep blue sea. It is an area full of hotels, restaurants, discos, discobars, and much more. Not far from here, near Perivolos, you might think to stop for lunch by Ammos Seafood, wonderful Taverna where you can try some fresh fish. Excellent quality / price, it is a worthy conclusion of your holiday. Kambia, represents more than a valid alternative. Try to find some time during your vacation to dive into the crystal waters of this beach, located in the south-west of Santorini, between White and Red Beach. Unlike both, Kambia it can also be reached by own means, through a dirt road route. Kambia It is a rather quiet and small place, equipped with umbrellas and sunbeds (7 € about the cost) arranged in only two rows. Right here, you will find a great Taverna serving fried fish: a must try! We hope that from this guide you could have all the information you need to plan your holiday. We just have to wish you GOOD TRIP and a good holiday in Santorini.